So you’ve arrived in Toronto, unpacked and got settled into a hopeful life. Your new Canadian friend invites you over for a BBQ on Sunday to meet some people, begins at 8:00 p.m.
Two problems there. (1) There is no off licence in Toronto — it’s called the Liquor Control Board of Ontario [notice the word “control”] and, (2) Most of them close at around 5:00 p.m on a Sunday. No booze for you, mate! Nope. Loads of bread, milk, meat, fish and a fine selection of produce … but no booze. Sorry. You’re going to be the freeloader turning up at the BBQ to eat your host’s food and — egads! — drink their booze. The shame. 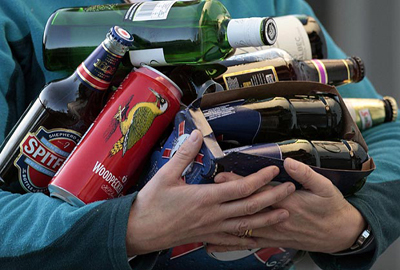 A Brit turning up to a party empty-handed. In Great Britain you can go and get your groceries on a Sunday, walk to the next aisle and grab some wine and/or beer. All very civilized, convenient and so adult. In Toronto you’re driving to two different places for food and booze, or even three if you prefer to buy some beers at The Beer Store. There are some independent wineries that may open slightly longer, or grocery stores (usually the larger chains) that have a small independent presence — but the choice of brands is just not there. It’s ridiculous! Mac’s Convenience Stores Inc. is promising to invest $54 million dollars to build 27 new convenience stores in Ontario if it is granted the right to sell alcohol in Ontario. — Full story. But who knows how long that will take? And why the delay? Do the people — like us, who enjoy the freedom to buy wine and beer when and where they want — and who get to make these laws and vote on issues like this, really think it’s sensible to limit the output? What about alcoholism, I hear you cry. It will encourage us to buy more booze. Make it easier. I personally don’t agree with that. People who want to buy more can do it now anyway. I’ve seen customers leave with boxes of booze. How will expanding outlets and opening up the competition add to that? It’s really frustrating and hard to get used to at first as a new Brit in Toronto. Maybe things will change soon, and when they do, I’ll raise a glass to that. This entry was posted in Uncategorized and tagged beer, booze, brits in toronto, lcbo, liquor, wine on October 10, 2013 by britsintoronto. You liked the X-Files too, right? It’s the same stupid excuse everywhere… The government thinks it has to protect us from alcohol. We are all adults and should be treated as such. Kids can’t buy alcohol anyway.